Is it Too Late to Resurrect the Last, True Competitive Advantage? 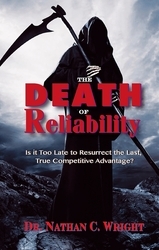 Are we facing the death of reliability? Some believe this is the case, particularly when it comes to reliability leadership. Without qualified leaders, there can be no true reliability, and as such, companies are losing out on the one real competitive advantage available to them today. About thirty years ago, organizations would invest time and money in their employees to develop craftspeople. Nowadays, many companies use shortcuts to try to achieve reliability, often fudging numbers to make it appear that they are progressing in the right direction, or using abbreviated training rather than full apprenticeships to produce skilled craftspeople. Unfortunately, they’re simply covering up the unreliability that causes them to lose ground and increase costs. The misguided shortcuts used to circumvent hard work and effort are eroding craft skills. There are three components that are the root causes of unreliability, and, if eliminated, will lead to reliability: 1. Improper Lubrication; 2. Contamination; 3. Improper Installation. Dr. Wright goes above the “what” and “why” of reliability found in other resources to offer the “how to” of reliability. To visit the home page for this product, download valuable online resources, and contact the author, Nathan Wright, click here.